The Synod meeting takes place in the Holy Metropolis House of Boston under the Presidency of His Eminence Metropolitan Ephraim of Boston, on September 21/October 4th, 2010. 1) Motion by Metropolitan Moses to except [sic: accept] the motions of the previous Synod meeting. 2nd by Metropolitan Ephraim. Motion carries unanimously. Having clearly examined the ecclesiastical situation in the Orthodox Church within the past decade, the Holy Synod of the Orthodox Church in North America has unanimously resolved to continue the path that it has been following, namely to "follow in the footsteps of the Holy Fathers". These Holy Fathers from generation to generation have fought tirelessly to preserve the Orthodox Faith and the unity of the Faith, witnessing It's purity to the world. Our contemporary struggle as the local Orthodox Church in America deals with the heresy of Ecumenism. As is the case in every generation, whenever heresy enters into the Church, much confusion and even administrative division results. Holy Fathers such as Saint Cyril of Alexandria, St Eusebius of Samosata, St Meletios of Antioch, St Basil the Great, St John of Kronstandt, and many other holy fathers, taught that the unity of the Orthodox Church is an important dogmatic reality, since it is an expression of the love which Christ taught us and which is the greatest commandment of all. The Saints prayed for unity in the Liturgy ("make to cease the schisms in the Churches" Liturgy of St Basil the Great). Today, however, we see with great sorrow that suspicion, malice, ambition etc, have displaced the love among some Orthodox Christians. We believe that this suspicion and malice must cease; otherwise, it will be the cause of greater harm. Within the past five years, our Synod of Bishops have come to the realization that the Unity of the Faith is of utmost importance. Therefore, by Divine providence, we have found ourselves, albeit unofficially, having dialog and friendly contacts with members of the Synod of the late Archbishop Chrysostomos Kioussis of Athens. This is only fitting since this Synod is the closest Synod to us, since our Church in North America was established by the Church of Greece under the Presidency of His Beatitude, Archbishop Auxentios. The two Synods found themselves separated in 1984, but this separation had nothing to do with matters of Faith and both Synods officially have an identical ecclesiology. After the repose of Archbishop Auxentios, the Synod of Archbishop Chrysostomos lifted their depositions against the Archbishop and reinstated him in the diptychs. Now that Archbishop Chrysostomos Kioussis has also reposed, we bring to mind the words of St Photius the Great: " Let God consign previous events to oblivion. As for us, let us find strength in forgiveness and not call wrongs to mind. It will be best to remain silent about these affairs, or at least to speak about them only briefly and with restraint. Since we are sinful and insignificant people, it will be best to stay quiet about the enmity we caused; only in the case of great need should we speak about it at all". For reasons of Church unity, the Holy Synod of the Orthodox Church in North America also unanimously resolves to lift depositions imposed in 1985 against those bishops currently be-longing to the Synod of the late Archbishop Chrysostomos Kioussis, with the aim of achieving full Eucharistic Communion in the future with this Synod, whensoever God wills it. In lifting these depositions, we hereby recognize de facto that the Church of Greece is headed by the Synod of the late Archbishop Chrysostomos Kioussis. The faithful who travel to Greece are free to attend the Churches which belong to this Synod with the full blessing and approval of our Synod of Bishops. 2nd by Metropolitan Ephraim. Motion carries unanimously. 3) Motion by Metropolitan Makarios that the Holy Synod dissolve the office of locum tenency of the throne of Athens held by Metropolitan Makarios up until now. 2nd by Bishop Demetrius. Motion carries unanimously. 4) Motion by Metropolitan Moses that the Holy Synod write a letter of condolences for the re-pose of Archbishop Chrysostomos to the Holy Synod of Greece. 2nd by Metropolitan Ephraim. Motion carries unanimously. 5) Motion by Metropolitan Makarios that the Holy Synod write a congratulatory letter to the new Archbishop of Greece. 2nd by Metropolitan Ephraim. Motion carries unanimously. 6) Motion by Metropolitan Ephraim that we adjourn the meeting of the Holy Synod and meet again the next day. 2nd by Bishop Demetrius. Motion carries unanimously. The meeting of the Holy Synod continues on September 22/October 5, 2010. 1) Motion by Bishop Demetrius that Priestmonk Basil of Holy Transfiguration Monastery make a study on Eparchial Synods. 2nd by Metropolitan Ephraim. Motion carries unanimously. 2) Motion by Metropolitan Makarios that Ecclesiastical decrees that require the signature [sic: signature] of a hierarch must be promulgated and signed by the ruling hierarch of the local Metropolis. 2nd by Bishop Demetrius. Motion carries unanimously. 3) Motion by Metropolitan Moses that we adjourn the meeting of the Holy Synod. 2nd by Metropolitan Ephraim. Motion carries unanimously. Dear Masters, purported internal theological errors in the Epistle of the Russian Synod of August 1913 are not at issue here. The issue is that the whole Orthodox Church has accepted all the synodal decisions regarding Name-worshipping without conditions and reservations, but you wish to qualify your possible acceptance of these decisions. Certainly, no sound Orthodox Christian, including us, on coming across a genuine theological error, would agree with that error, but that does not invalidate the decisions. In actuality, the Name-worshippers are not concerned with the internal theological errors; they are concerned with the decisions, themselves, which condemn the teaching they advocate. This is their real target. None of this was an issue anywhere in the Orthodox Church until today’s Name-worshipping advocates made it an issue. The whole Church, and our jurisdiction there-in, was in peace over this matter until it was recently thrust on the Church. So, since you have permitted the Name-worshipping doctrine to come into our midst, we have been asking you to make it clear that you accept the decisions without conditions and reservations just as all of Orthodoxy has done now for about 100 years. Further, if you say it is the proper province of the Russian Church to deal with this issue (and that Church has been at ease with the decisions), who is our Synod, and what are you doing raising the issue and nit-picking your way through the decisions? In any case, it is clear to us from your response of 29 August/11 September, 2012, and from your earlier statements, that you object to the decisions against Name-worshipping as they have been universally accepted by the Orthodox Church. This puts you in opposition to all of Orthodoxy and to New Hieromartyr St. Tikhon’s expressed position that these decisions stand. Therefore, we herewith submit our withdrawal, together with the majority of the pa-rishioners of St. Mark of Ephesus Orthodox Cathedral who on this day have voted to do so, from The Holy Orthodox Metropolis of Boston under the jurisdiction of The Holy Orthodox Church in North America. We are leaving on the canonical grounds of pre-serving our Orthodox Christian confession of faith. Because of this reason alone, we are not creating a schism. Yet further in this regard, we are not creating a new synod but going to a Synod of Bishops that already exists. Indeed, we are seeking refuge in the very Synod of the Genuine Orthodox Church of Greece which you, in your decisions, dated September 21/October 4, 2010, by your de facto recognition thereof and the lifting of the depositions (Motion 2) publicly and synodically acknowledged to have soundness in its confession of Faith and integrity in its canonicity, so much so that you dissolved the office of locum tenens of the throne of Athens (Motion 3), effectively relinquishing the See of Athens to that Synod. We pray for the forgiveness and blessings and salvation of our merciful Savior on us all. Amen. We recently welcomed Bishop Gregory Lourie as a visitor to our monastery in Boston. While here, he asked if he could receive Holy Communion, and after we consulted among ourselves, and upon asking the counsel of other of our clergy, we agreed to share the Holy Mysteries with him. By doing this, we did not intend to get involved in theological debates that have raged in the Russian Church for some one hundred years now. Nor do we intend to take sides in them. In hindsight, it would have been more prudent perhaps to wait until that time when this issue and other issues in the Russian and Greek Churches are addressed. At the same time, while we realize that many matters still divide them, we want to promote unity among all these groups. If we erred in our judgment, we ask forgiveness, since it was an honest mistake committed out of a desire to foster the oneness that must exist among all Orthodox Christians in the Holy Body and Blood of our Saviour. 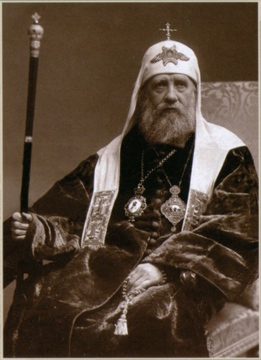 It is true that, as they themselves admitted to us, our predecessors, St. Philaret of New York and Archbishop Auxentius of Athens, also made missteps in the confused times and conditions that the Church now finds itself. But their love of the Truth, their purity of intention and their confession of Orthodoxy was also evident and true. We ask for your prayers that God may help us navigate in these turbulent waters that surround the Ark of the Church. We seek only your ― and our ― salvation, and we call upon the mercy of God to overlook our human failings. May God protect and shelter all of us. In his second epistle, St. Peter wrote, "Ye therefore, beloved, seeing ye know these things before, beware lest ye also, being led away with the error of the wicked, fall from your own steadfastness." (2 Peter 3:17) Dear Despotas, I am writing to you because I believe you have fallen into such an error. In your statement of November 19/December 2, 2011, you characterized imyaslavie (name-worshiping) as an open theological debate which has raged in the Russian Church for some one hundred years. This is false. Imyaslavie is a heresy condemned one hundred years ago by both the Church of Constantinople and the Church of Russia. And since then there has been no debate within the True Orthodox Church. Based on this false view, you have made and continue to make grave errors. The most serious of these is your insistence on consecrating Priestmonk Gregory (Babunashvili). All 200+ bishops of the Russian Orthodox Church accepted the decision of the Holy Synod. The elders of Optina Pustyn, Valaam Monastery and of all other monasteries throughout Russia also received the decision of the Holy Synod without question. Among 4,800 Russian monks on Mt. Athos, about 800 professed this heresy, but many of them later repented. The seven members of the Holy Synod of Russia which condemned this heresy included Metr. Anthony Khrapovitsky and Proto New Martyr Vladimir, at that time Metropolitan of St. Petersburg. You could hardly characterize them as bureaucratic hierarchs with "shaky theology" or little knowledge of the Je-sus Prayer. Attached, please find the 1913 report of Metr. Anthony on imyaslavie. It is patristic and sound. The Holy Synod of Russia never repealed its decision. Our venerable hierarchs and fathers in faith, Metropolitans Anthony, Anastassy and St. Philaret of the free Russian Orthodox Church Abroad, never treated imyaslavie as an open question. The only figures to defend the teaching of imyaslavie or to question its condemnation as a heresy were the original teachers and disciples of this heresy; followers of heretical philosopher Vladimir Soloviev such as Sergey Bulga-kov, Nikolay Berdyaev, Alexey Losev, and Pavel Florensky, who laid the foundation of the corrupt Paris theological school; "Bishop" Ilarion Alfeyev, a Moscow Patriarchate "theologian", whose background, education, and experience are all suspect; and Gregory Lourie, a self-described purveyor of punk Orthodoxy and self-proclaimed bishop. You have admitted that you erred in allowing Lourie to be communed at Holy Transfiguration Monastery in October of last year. An academic who philosophizes over details while failing to grasp fundamental truths, Lourie has published sermons on such topics as why St. Nicholas should be worthy of veneration when the few hard facts reveal him as an ordinary provincial bishop and when the miracles attributed to him seem mythological. Far from traditional Orthodoxy, to say the least. Over the course of many years, the Synod of Bishops of the Russian Orthodox (Autonomous) Church has received several complaints from bish-ops, priests, monks, and lay persons, concerning intolerable and extremely scandalous remarks made by you, together with your spreading of the heresy of "name worshipping," and, despite the fact that you were warned several times to cease and desist from disseminating heresy via the internet, and you promised to abandon your waywardness and return to the true path, which leads to salvation, you continued, and even until now continue, to spread the heresy of "name worshipping," publishing the false teaching of hieromonk An-thony Bulatovich on the web page Portal-Credo.ru. True to his nature, Lourie disputed the details of the procedure by which he was defrocked. He failed to accept the essence of the matter: because of his militant belief in imyaslavie, the synod considered him no longer worthy of the priesthood, and later even excommunicated him and his followers. Lourie continued to serve in rebellion. In November of 2008, he dared to accept consecration as bishop by two bishops suspended by Metr. Valentin, taking for himself the title last rightly held by the New Martyr Metr. Joseph, "Bishop of Petro grad and Gdov." Further, despite claims of persecution, Lourie's parish of St. Elizabeth the New Martyr is the only nonMoscow Patriarchate parish that has been allowed to function openly in St. Petersburg in a traditional church building open to the public. In Putin's Russia, this can only mean Lourie has powerful governmental protection. In other words, he is not only pseudo-Orthodox and even heretical in his beliefs, a pseudo-bishop in his canonicity, but he is also clearly perceived as useful in some way by the government. Your failure to grasp both the heretical nature of imyaslavie and the utter unworthiness of Gregory Lourie are why Priestmonk Gregory is still a candidate for bishop. In his letter of November 25, 2011, Fr. Gregory openly supported both the heresy of imyaslavie and the canonicity of Lourie, whom he has also described as a renowned theologian. (!!!) God allowed him to reveal both his heretical beliefs and his poor judgment before his consecration. Yet all you have asked him to do is to promise to keep these opinions to himself. Despotas , how can you think this is satisfactory? Since when is it acceptable for a bishop to believe in heresy but keep it to himself? Since when is a man who believes in heresy a valid candidate for consecration? You continue to look to St. Metr. Philaret as an example; how can you imagine that Fr. Gregory would have been acceptable to him? The consecration of a bishop is an extremely serious matter for the whole Church. In a small synod like ours, the man who is chosen will influence decisions for years to come. Candidates should be men whose Orthodox faith and judgment are unimpeachable. With more than thirty monks at Holy Transfiguration Monastery, it is simply impossible that the best qualified candidate is this relatively unknown man who came to this country less than five years ago, was tonsured barely two years ago, and who now has revealed these serious errors in faith and in judgment. If you do not wish to "fall from your own steadfastness," you should not consecrate him. If you are truly seeking the best candidates and desire the unity of the Church, I respectfully urge you to tum to the whole Church to nominate new candidates. Let men be chosen who are supported not just by a majority of the Holy Synod, but by the laity, clergy and bishops. Let there be several candidates, and let the one to be consecrated be chosen from among them by lot. In this way, setting aside our own will in this matter, we would allow God's will be revealed. I kiss your right hands and ask your blessings. In both written and verbal communications with you over the years, I have said to you that, if a son really loves his father, then, when a son sees his father in error, the son—precisely because he loves his father—corrects him. So I communicate again now with you in this same spirit because I love our Savior and His Church and you, my fathers in the Faith. Over the last week or so, it has been established that Bishop Gregory Lourje of one of the non-State Church Orthodox jurisdictions in Russia, with the consent of the three of you, received Holy Communion with His Eminence Ephraim during the Divine Liturgy at Holy Transfiguration Monastery sometime near the close of Bishop Gregory’s very recent visit there. I am astounded by how muddled and inconsistent this decision has rendered our ecclesiology and by the entire manner by which you came to this decision. When I arrived at the Monastery for the Saturday Divine Liturgy approximately two weeks ago, it happened to be right at the time of Bishop Gregory’s departure. Fr. Panteleimon asked me to greet Bishop Gregory, whom I did not even know was in town (which, of course, does not matter) and briefly introduced me to the bishop. I asked Father if the bishop is one of ours, and he said yes. Shortly after greeting the bishop, I approached His Eminence Ephraim, who was seated in his usual spot in the office, and inquired about this bishop. His Eminence took the time to provide me with a brief background, told me we were reaching out to this man in the spirit of trying to establish an ongoing relationship that might eventually lead to a Sister Churches type of intercommunion, said that we advised this bishop to attempt to join the Tikhon Synod, noted that there were conflicts between this man and that Synod, and remarked that he (His Eminence Ephraim) did not fully comprehend all of the issues, part of which centered on the "Name of Jesus" controversy in the Russian Church. His Eminence gave me the very distinct impression that we would cautiously proceed to evaluate Bishop Gregory and the situation in Russia, which seemed fine to me. And then, this past week, I learned about the bishop’s receiving the Mysteries, which would have had to happen before His Eminence and I had the aforementioned conversation. How, I ask, is it proper to commune with a bishop whom we are still evaluating and the controversies around whom we do not understand? Such a weighty decision—bishops com-muning with one another—is made on the basis of an impromptu phone call while the jury is still out on Bishop Gregory’s trustworthiness? How do we jump so fast to communion with this man, whom we truly barely know, while exercising all due caution, for example, with a bishop from another jurisdiction who has been in direct communication with us for over a year and with whom you have met and held discussions in person on more than one occasion? You write, laudably, in your recent "A Historical Clarification" that it is our desire to be in communion with those who, in effect, have canonical and confessional integrity. Where have you estab-lished that this Bishop Gregory meets this criterion? And here is one glaringly obvious way in which you have seriously confused our ecclesiology. If you can commune with a hierarch whose canonical and confessional integrity we have not thoroughly studied and the controversies around whom we do not adequately comprehend, then, by your own unanimous decision of a little over a year ago when you officially recognized the Kiousis/Kallinikos Synod as the legitimate True Orthodox Church of Greece and turned over your responsibility for Athens to that Synod, you must forthwith commune with each and every one of the hierarchs on that Synod, whose canonical and confessional integrity you have determined and publicly proclaimed. Beloved Masters, do you grasp the scandal and ecclesiological inconsistency and undermining of our own canonical and confessional integrity? As for Bishop Gregory, by your own standards, either you have to produce—for the whole Church to see—the evidence of your study of him and his situation and his canonical and confessional integrity or you publicly have to repeal communing him until an unhurried and thor-ough evaluation and a proper and correct decision can be made. After all, you have an entire Church to answer to. Sad to say (for us), but even the Kallinikos Synod, its shortcomings not-withstanding, took longer in its deliberations and response time before accepting into commun-ion our departed hierarchs, clergy, and parishes. And this brings us—yet again—to the beyond lamentable manner in which we govern the affairs of our Church. You have objected to the description of our Synod as dysfunctional. Fine; I’m not wedded to that specific word. But please tell me what word you would use to describe a group of people who do not adhere to their own policies, who act impulsively (in contradiction to their oft-declared "cautiously"), and who, in the face of ongoing, self-inflicted damage to our Church, steadfastly make momentous decisions without full, well-rounded consultation and deliberation. As for inconsistency with our Synod’s policies and impulsivity, so as not to belabor these points, the several paragraphs prior to the one before this constitute ample evidence. Surely, given all of our past communications, I do not have to repeat prior instances. If you simply had adhered to your own policies and to your purported caution, Bishop Gregory receiving Holy Communion would not now be an issue. And this brings us to the third point, advice and guidance, beyond whatever you may or may not be obtaining now. When we were searching for an Orthodox hierarch in 1987, follow-ing ROCOR’s departure from the Confession of Faith of St. Philaret, the whole church was involved—yes, even laymen. Further, we took several months to make our decision, and, when Archbishop Auxentios came increasingly into view, we actually met with him more than once, asked him anything and everything we wanted, answered any and all of his questions, and then decided the matter together, as the whole Body of Christ. On and off over the last six years or so, the clergy have urged that you seek full counsel before deciding issues with serious ramifications. One suggestion has been the establishment of a standing board of advisors composed of parish clergy and perhaps laity. Another suggestion has been the convening, from time to time, of a Church-wide council. In both cases, their function would be to study carefully and to give you direction on how to handle serious pastoral and administrative issues and controversial matters of con-sequence. Both approaches have been applied in the Church throughout the centuries. These three examples stand in sharp contrast to the way our Holy Synod, especially these last several years, determines how to handle situations with significant repercussions or arrives at decisions with far-reaching consequences. Unfortunately, our history gives the impression either we are not aware of either of these potential outcomes or we just do not care. Indeed, I posit that because, to date, you have effectively ignored the suggestions above regarding advisors and councils, some of your more significant decisions and courses of action have increased the tension, turmoil, and division in our Church. Our Synod’s handling of weighty matters and decisions appears to be less thoughtful and open and conciliar within the context of an entire Church and more, I’m sorry to say, impetuous and private and personal, with the too-frequent aura of backroom deals. I know we are capable of conducting the business of the Church much better than that. You have seen as recently as the end of this September in a meeting with clergy with His Eminence Ephraim and, again, at the last Synaxis that a number of clergy share this concern. In fact, some said they were relieved to learn that other clergy have the same understanding of our conduct and the same concerns addressed in this letter and in previous communications with you and that these concerns have been raised with you, but they are thus far disappointed in our Synod’s overall response. They said they would receive, on occasion, material from our hierarchs showing support for how our Synod was handling a controversial matter, but the same clergy never were made aware by our hierarchs that there were serious opposing views to how our Synod was handling things. I, too, was reassured to learn that others of my brother clergy are of a similar mind. Are you not tempting God by willfully (after all, you are not in ignorance here) continuing to preside over this self-inflicted destruction? And if you are, for how long will our Lord forbear? You know He allowed His people to be defeated in war in order to teach them to have faith in Him and to be obedient to His will. Clergy, laity, and parishes have departed, a sizable number of our remaining clergy and laity are in dismay and are having temptations, and all of our mon-asteries (what’s left of them) are, at best, on shaky ground and/or divided. (This includes Holy Transfiguration; just pay honest attention to what is going on around you.) And all of this is re-lated to our Synod’s conduct. Are we to lose, perhaps irretrievably, everything built up by di-vine grace and our decades-long labor before we mend our ways? Kissing, again, your right hands, I remain your unworthy servant in our Lord Jesus Christ. P.S. Some of those same clergy asked that they be "kept in the loop" concerning matters such as these. Thus, whereas in the past I have not sent my communications with you broadly to others, I am sending this letter and similar others in the future to those who asked to be kept up on such things. A passage from the Holy New Hieromartyr Patriarch Tikhon's Nativity epistle to diocesan hierarchs in 1921 is often misrepresented and mistranslated by proponents of name-worshipping in an effort to portray Patriarch Tikhon as sympathetic to their cause. On September 11, 2012, the remaining three bishops of the synod of the Holy Orthodox Church in North America (Ephraim of Boston, Makarios of Toronto and Gregory of Concord) issued a statement on name-worshipping, in which they attempt to use this passage from the Nativity Epistle of Patriarch Tikhon in exactly such a way. They continue to insist on boiling down the essence of Patriarch Tikhon's words to these four points, which even the most fervent advocate of name-worshipping, Gregory Lourie, could embrace.